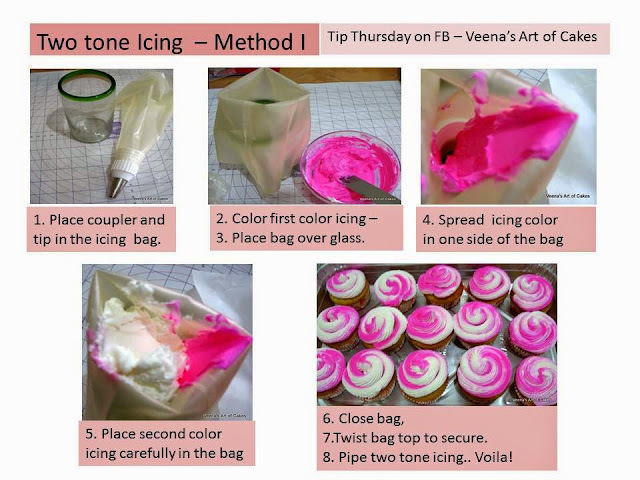 When I posted my video of cupcake decorating, I had a lot of emails asking me how I did the two tone piping bag. Updated – Tip Thursday on Facebook. Nozzles. I’m using the Wilton cupcake tip with the large coupler. You could use the same method with your small bags and small tips when working on a cake. Here I am making cupcake swirls, hence everything large! Get a tall glass or jar and your piping bag ready. Place the bag, nozzle side down in to the glass and open the bag around the glass so it is easy to work. Don’t worry about a little mess. You can always clean it up. Get the two colors ready. Here I am using Pink and White. You can see the pink. The white is in my mixing bowl. Using a spatula like this scoop pr a knife and spread it into your bag on one side upwards. So the Pink is on one quarter of my bag. The amount icing you put of each color in the bag will determine the density of swirl you will get. Here I am looking for a little pink blend into the white, so you can see my ration of icing will be about 1:3 parts. If you wanted just a line of icing like on my other cupcakes, you would use a ratio of 1: 10 which means you would use a knife and just use a small amount of icing place in a thin steam into your bag. Hope I’m making sense. Next, fill in the second color. Here I’m using white. Next, Close the bag and seal the top with a clip or rubber band. 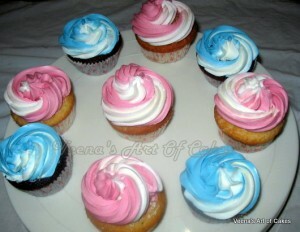 Squeeze some icing out until you reach a two tone effect your looking for. The beginning might be an out put of all white or all pink depending on how close to the nozzle your color is spread. Once the two colors meet you will have a nice two tone effect. 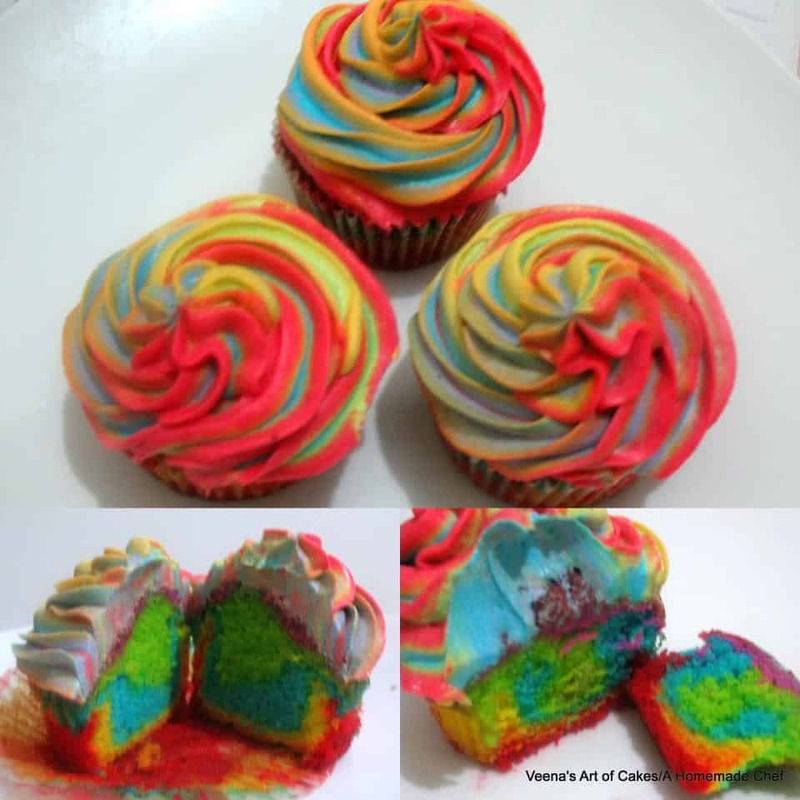 Place the cupcake on the surface, Hold the piping bag at 90 degrees and pipe a swirl from the outside in. And there you have it. A two tone effect. 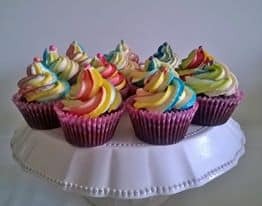 I love how each cupcake looks unique and different. Thanks for this tutorial. The concept is simple and fun and love the result!